Frankie Fraser, the celebrity criminal gangland enforcer spent 42 years inside, was certified insane three times, and has been a fire-bomber, a rioter, but first, last and always, a thief. Fraser’s factory worker father and his Irish, cleaner mother welcomed Frankie into their family on 13 December 1923. Frankie always wished he’d been born on the 12th, the same day as his hero, Frank Sinatra. 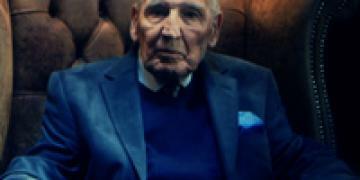 Unluckily, Frankie Fraser’s birth-date would also be the date for many of his future arrests. Frankie was one of five children raised in the family’s South East London home. It was an area of extreme poverty plagued by money lenders and prostitutes. Frankie looked at his father, an honest man working seven days a week and at his mother working her fingers to the bone. Frankie wanted different. His sister Eva agreed with Frankie and together they started stealing. They could steal in one go what others earned in a week. Frankie didn’t much like school but he did like playing sport. His favourite sport, still legal for schoolchildren then, was boxing. Frankie didn’t like to lose. Outside of school, Frankie was fast learning the then criminal code: Never inform and never hurt women or children. Frankie was first ‘nicked’ for stealing cigarettes at 13. He would go on to collect 26 convictions and spend nearly half his life inside. Some of Frankie’s happiest times came with the outbreak of the Second World War in 1939. As every able bodied man, and most police, joined up to fight the threat of Nazism, Frankie deserted and looted. Blitz bombed Britain was a goldmine for Frankie. It was said that if one stuck on an air raid warden’s helmet, a gullible public would actually help load up a van with stolen goods. With few proper police left, Frankie ran rings around the remaining ‘Specials’- volunteers and retired policeman. He took advantage of the rationed food and goods to sell on marked up items on a booming black market. And the blackout-intended to deny enemy bombers easy targets-provided perfect cover for criminals like Frankie who liked to operate in the shadows. It was during this time that Frankie started to hang out and drink with Charlie Kray, elder brother of the Kray twins. As the pubs shut at three in the afternoon, Charlie used to take Frankie home for a meal. There he would meet the twins, still in shorts and just out of primary school. They called him ‘Uncle Frankie’. But Frankie’s money making came at a cost. In the spring of 1943 he took part in a bid to release another army deserter from Wandsworth prison. The attempt left two people dead. The Allied victory in Europe in 1945 was the answer to many prayers. For Frankie it meant the nightmare of the return of a proper police force.